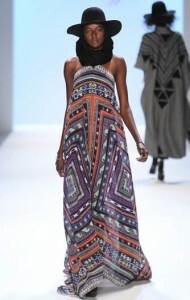 Mara Hoffman is well known for her intricate prints and innovative execution. Her Fall 2012 collection at New York Fashion Week was no exception to her reputation. The line was inspired by “South American Shaman Cowboys,” giving off a Mayan culture vibe. 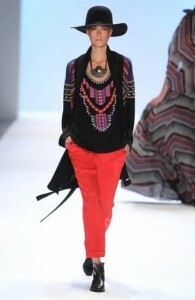 Tribal designs exhibited Aztec-like prints among oversized knits and flowy dresses and skirts. 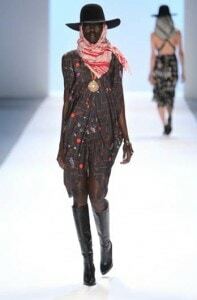 An interesting recurring trend to be found in this collection were headscarves under styled cowboy hats. Ordinarily I don’t love this look, but it worked well with the detail of each piece. Many of the knits had a hypnotic appearance, as though I were looking at an optical illusion. Color trends to be found in this collection were black, navy, orange, and brown. 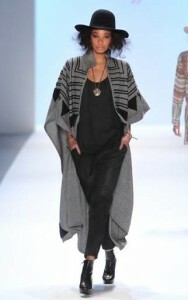 The audience was wow’ed by Mara Hoffman’s Fall 2012 line, including celebrity fashionista, Whitney Port. 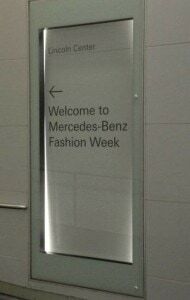 This was yet another exciting and successful runway show. This has been such a marvelous Fashion Week and it’s not even over yet. I tend to get excited just by the poster sign that points me to the direction of the tents (see below)!